Henley Honda | Community | Where Will the Honda Indy be Held Next Year? Where Will the Honda Indy be Held Next Year? With the 2014 race fresh under our belts, plans are already underway for 2015 – but it isn’t all smooth sailing (or driving) as of yet. The Pan-Am games are coming to Toronto next summer, and will be running throughout July, thus not allowing for the Indy to be run there at the same time (which is always mid-July). It would also be difficult to move the race to a different week, as the Indy circuit schedule is usually packed with about 18 events throughout the summer. The race’s owners, Savoree-Green Promotions of Indianapolis and representatives of Canadian Tire Motorsport Park announced Friday that although no decision has been reached, they have discussed moving the race from downtown Toronto to the Motorsport Park near Bowmanville, ON. In a statement last Friday, Charlie Johnstone, president of the Honda Indy Toronto, said the Pan-Am Games “have forced us to consider alternative dates and venues for next year’s race” and that an announcement would be made shortly. 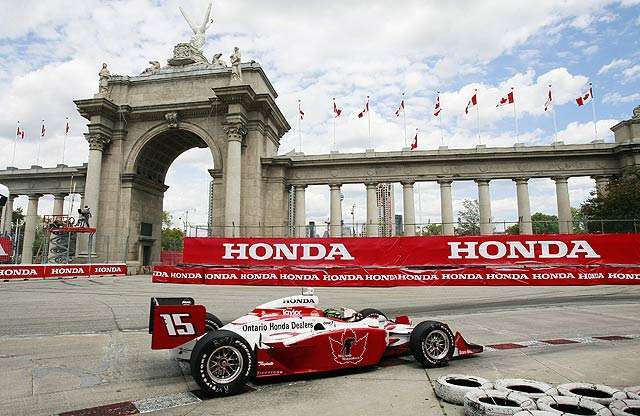 While it would be a shame for the Honda Indy to leave downtown Toronto, where it has been since 1986, sometimes change is a good thing. The coming weeks will be crucial in determining if there’s time to retrofit the Motorsport Park, or if the Honda Indy will have to be moved elsewhere.